In a world that emphasizes immediacy, we choose to anchor ourselves in the tradition of craftsmanship and thoughtful execution. Our process begins with only the best materials and ends with forms that can be admired for a lifetime. Japanese Craftsmanship, with its unique heritage of combining handcrafted techniques and innovative technology, is unmistakable in every piece of Matsuda Eyewear. Each finished Matsuda Frame is an art object unto itself - as pleasing to the hand as it is to the eye. Matsuda Eyewear: luxury through material, quality through craft, innovative by design. Mitsuhiro Matsuda is recognized as being the first fashion designer to meld art, architecture and fashion. Born in Tokyo, Matsuda was exposed to design from a young age. After attending the renowned design school, Bunka, in Tokyo, Matsuda moved to Paris with his best friend, Kenzo Takada, to find inspiration. In 1967 Matsuda returned to Tokyo and created Nicole Co., releasing designs known for intricately detail, yet surprisingly restrained interpretations of classic styles, Matsuda's designs became a favorite of celebrities and design aficionados throughout the world. He became a part of the “Tokyo Design 6”, a group of up and coming designers that founded Tokyo Fashion Week. By 1996 he had over 500 stores in the fashion capitals of the world. He was considered one of the leading Japanese menswear designers, showcasing his collections alongside the most highly regarded brands in the world. Matsuda’s time spent in Paris was a great source of inspiration for many of his designs. He loved the whimsy of the art deco period, the industrial metal work of the late 1800’s, and the detail he found in gothic cathedrals. These influences are most evident in the intricate lacework of his clothing and the fine engraving found throughout his eyewear collections. Matsuda's legendary Japanese eyewear collection has long been known for its exquisite craftsmanship and impeccable attention to detail, design, and use of engraved metals. Painstakingly crafted by hand in the artisanal eyewear workshops of Japan, each Matsuda creation represents over 40 years of design history and heritage. A longtime favorite of celebrities and fans of luxury eyewear, pop culture boosted Matsuda in the early 90's when Linda Hamilton a.k.a. Sara Connor donned Matsuda sunglasses in the blockbuster film, Terminator 2. The Precious Collection makes use of luxurious materials, including hand engraved sterling silver, solid 18k gold, and buffalo horn. The Essential Collection features new designs drawing upon classic Matsuda details made of pure titanium, stainless steel, and premium Japanese acetate. The Heritage Collection consists of limited production re-issues of best-selling original styles. Mitsuhiro Matsuda was part of a group of trailblazing Japanese design talents (which also included Junko Koshino, Yukiko Hanai, Isao Kaneko, Takeo Kikuchi and Kansai Yamamoto) who, in 1974, formed Tokyo Designer Six - creating Tokyo's first official fashion week. He showed his collections on the international stage in New York and Paris in the Eighties and his label Nicole, still has a large presence in Japan. Known for his soft, yet structured, architectural sense of clothing, Matsuda was a fashion forerunner whose unique, naturalistic and earthy color sense influenced many other designers who followed him. Probably more than any other designer, Matsuda blazed a path in sunglasses with his Japanese sensibility and high tech pop aesthetic. His vintage shades remain cult collector items for connoisseurs of sunglasses. Matsuda was born in Tokyo in 1934. An ambitious youth, he studied at Japan's famed Bunka school of fashion where his fellow classmates included Kenzo Takada and Junko Koshino. In the mid-eighties he was the architect's fashion designer, admired for his sense of structured silhouette, suits memorable for their arty nuances and crisp white shirts with unique façade detailing. Perhaps his lack of English hemmed him back, and his commitment to a particularly understated oeuvre prevented him from winning a larger audience among the mass public, but he will be remembered as a distinctive Eastern voice, who foretold the marriage of fashion and architecture, which is so prevalent today. In 1964, Matsuda and Kenzo sailed from Japan to Europe to make their way to Paris, the great beacon of fashion. After some six months, Matsuda returned to Japan, with no money, while Kenzo stayed. Back in Japan he founded his own fashion company, Nicole Co. Ltd in 1967. Matsuda's aesthetic and cultural allegiance outside of Japan is not to Paris, but to England and America. His first company outside of Nicole Company in Japan was Matsuda USA which opened a Madison Avenue boutique in 1982. Matsuda has delved into the Anglo-American sportswear traditions as ardently as any designer, even as much as Ralph Lauren. In the mid-1990s Matsuda sought to expand its brand throughout the U.S. and Europe, which included moving menswear designer Yukio Kobayashi, who had begun designing some womenswear, to the head all of the women's labels (Madame Nicole, Nicole Club, Nicole Sport and Zelda) in 1995. Matsuda himself also continued to design for women, but for the Asian markets. The following year, on a trip to New York, Matsuda scouted locations for possible stores. Though the Nicole brands (Madame Nicole, Nicole Sport, Boutique Nicole and others) were available in Saks Fifth Avenue and Barneys, as well as 500 stores in Asia and Europe, Matsuda hoped to bring his unique designs and growing licensed products to the U.S. in company-owned boutiques. Matsuda clients are ardently loyal, and his creations are profoundly progressive - the perfect combination for New York fashion and beyond. Matsuda died May 17 2008, aged 74, in his hometown of Tokyo after a long illness. 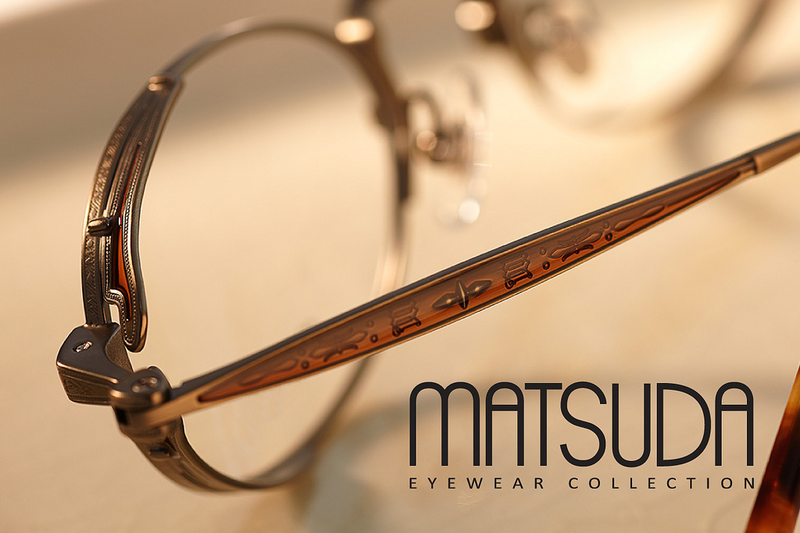 The Matsuda Eyewear Collection is still to this day known for their very ornate highly detailed frames. A true pinnacle of high-end luxury eyewear. Our frames are made from the finest metals, alloys, and acetate in the world - each material is chosen based on its unique properties that make it ideal for specific components. Some pieces need to be malleable (a nose pad arm that needs to be adjusted). Some need to be very rigid and solid (a hinge - if the hinge deforms, then the glasses won’t open or close smoothly). Some materials are chosen solely for aesthetic reasons. TITANIUM - Titanium is our preferred material to use - it has a very high strength, is hypoallergenic, is stronger than steel, lighter than aluminum and is extremely durable. BERYLLIUM COPPER - Beryllium Copper is used in casting. It is an ultra light alloy made of copper and beryllium that is very corrosion resistant. It is six times stronger than steel but is highly elastic. STERLING SILVER - Sterling Silver is a precious metal that is very malleable. Depending upon the purity and other materials used int he alloy, it can be hypoallergenic - exclusively used in our precious collection. STAINLESS STEEL - Stainless Steel is a durable, non-corrosive, not toxic, hypoallergenic and is a very good for decorated with pressing and stamping. Our lenses feature 100% UV A and UV B coating. CR-39 - a plastic lens material that is lighter and more impact resistant than glass. It is easily tint-able and allows for an infinite choice of custom colors. Mineral Glass - the most scratch resistant and optically clear of all lens materials. Polarization - reduces glare, allowing you to see more clearly. When light bounces off of certain surfaces (water, snow, glass, etc.) it reflects horizontally, and causes glare. Polarized lenses filter this horizontal reflection allowing you to see without the glare and improve contrast. Engraving is one of the most important steps in the process - there are only two master engravers left in Fukui - one of them works exclusively with Matsuda. Here is an image of a wide rim for one of our sunglasses being created. Machining is a process that is used in several steps of our manufacturing to create different components. Diamond tipped tools are used to machine sharp edges and precision cuts in parts that need to be perfect. Machining is also a critical step in developing the tooling that allows us to manufacture each Matsuda creation. Casting is a manufacturing process by which a liquid material is poured into a mold and then is allowed to solidify. The solidified part is also known as a casting, which is removed from the mold and used in the eyewear. Intricate pieces that cannot be created by machining must be created using this technique. This allows for faithful reproduction of the original piece that was handcreated by the prototype maker. Components such as temples and rim wire are made with hydraulic presses that can exert over 100 tons of pressure. The operators have to be very careful not to allow their hands to become trapped in the machine. Soldering is a process in which two or more metal items are joined together by metal components are heated with an electric current and are permanently melting and flowing a filler metal (solder) into the joint. Each Matsuda metal fused together. Seen here is the tooling that holds all of the components per frame has approximately 10 to 15 solder points which are joined by hand. The perfectly aligned while the solder is applied. Each frame or component spends over 24 hours in a drum polisher before being finished by hand. Not only does this allow for the polisher to provide a perfect finish, but also, the polisher is able to quality control the frame and make sure that there are not any defects. Palladium, 22.5k Gold, Ruthenium, and other precious metals are used to finish each frame This is done in a process called electroplating. Frames are put on a rack that is immersed in a solution filled with precious metal particles. An electrical current is passed through the rack and frames causing the metal particles to “plate” the frame. Here you can see one of the racks that hold the frames. Once all of the components have been completed, they are assembled by hand and lenses are inserted. They are adjusted and aligned before being pack- aged and shipped out. All Matsuda frames are crafted with the finest Japanese acetate. Japanese acetate, which is very dense, is known for rich colors and holding adjustment very well. The acetate is aged for three months to ensure stability before the manufacturing begins. The manufacturing begins with cutting the general shape of the frame out of the sheet of acetate. Some acetate styles are chosen for their unique patterns and colors. These have to be aligned by hand to make sure that the pattern is laid out correctly on the frame. The cutting is done by hand or on a five-axis CNC router. All of our frames have hand formed bridges to make sure that the fit is perfect. This takes years of study to master and there are very few people left in Japan that can do this level of work. Wire cores provide structure to the acetate temple, and help them to hold their adjustment. They are inserted into the acetate through ultrasonic heating or by lamination. Here, a wire core is being made by the pressing process. Some of our acetate frames are held together with rivets. Rivets are small metal pins that hold the hinge and the temple together. Rivets are the most secure method to attach temples to a frame front or hinge. Frames spend over 100 hours in a tumbler being polished by a mixture of bamboo, walnut shells, and polishing compound. Each manufacturer has a special mix of ingredients that is a key part of the finish that they provide. The final step in the polishing process is hand polishing and this is where the frame gets its character. In addition to providing a uniform finish, in this step the polishers make sure that where the temple meets the frame front is perfectly smooth and will not catch on a clients hair or clothing. All of our polishers have completed a 10 year apprenticeship to become master polishers. Once a frame has been polished, lenses are inserted and the frames are adjust- ed perfectly before being sent out. "We are beginning to think you never really own MATSUDA Eyewear. You just keep it on your face with the objective of passing it on to future generations in your family."